A Circle is defined as the collection of points where each point is targeted at equal distance from the center. There are a number of terminologies necessary to understand to get an in-depth learning of Circle. Center– This is a predetermined point where the surface of a circle is available at an equidistant point. Radius – The constant distance from the center to a given point is called the radius. 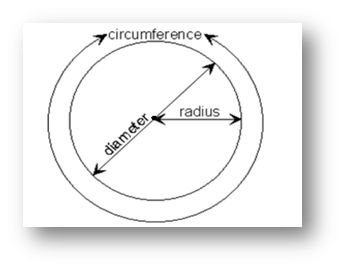 Circumference – The boundary of the circle is termed as its circumference. Chord – This is a line segment whose endpoints are available at the circumference of the circle. Diameter – The chord that crosses the center point of a circle is named as diameter. The surface area of a circle is the total space defined within boundaries of a circle. Since, the circle is a two-dimensional figure, in most of the cases area and surface area would be the same. Hence, this is clear that surface area of a circle directly depends on the radius r and value of π is fixed. As we discussed earlier, the circle is a two-dimensional figure, in most of the cases area and surface area would be the same. For example, the area A of a circle is the multiplication value of π R2. d is the diameter of the circle. C is the circumference of the circle. Where r is the radius, and the area A of a circle is π times the squared radius, and π = 3.14. 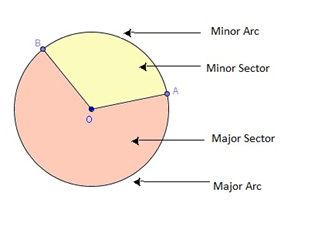 Sectors are the parts of a circle that are enclosed by an arc, two radii drawn to the extremities of the arc is named as the sector. The total space defined within boundaries of a sector is named as the area of sector of a circle and it is measured in terms of square units. 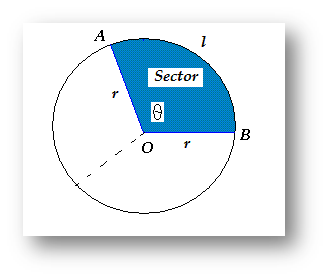 θ is the Angle of Sector of the circle. This is clear from the diagram that each segment is bounded by two radium and arc. So, the perimeter of a segment would be defined as the length of arcs (major and minor) plus the sum of both the radius. And the area of the segment is generally defined in radians or degrees. Where r is the radius of a circle and l is the length of the arc.